I just put up the first episode for Korea Study Abroad Guide on my YouTube Channel if you wanna go check it out. The second one is going to take me a while because I'm graduating and very busy dealing with unimportant group projects. But anyways... 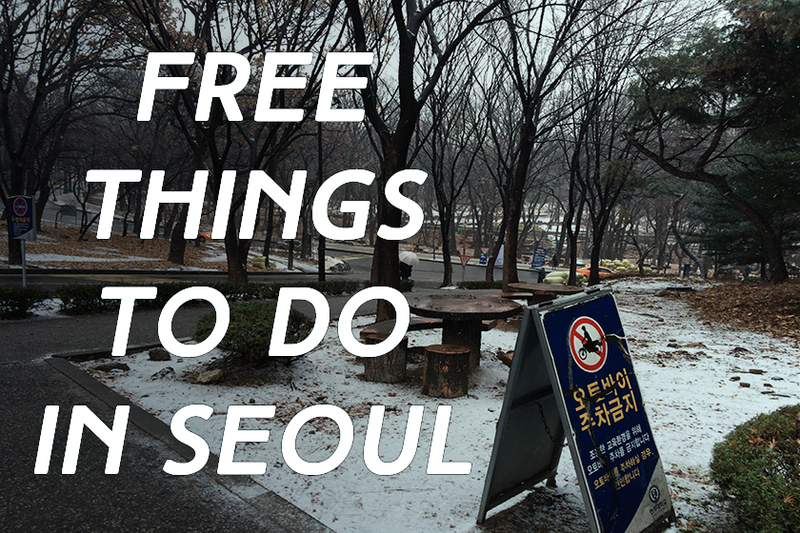 Since I talked a lot about budgeting in the video and promised that I would do a post on free things to do in Seoul, here it is! Most of them I've personally done but some of them I wish I knew about when I was in Korea. There's actually a lot of fun stuff you can do for free. So let's get to it. One of my favorite things to do at night was wandering around the streets of Sinchon or Hongdae and watching street performers. My favorite ones were those who played guitars. There's something so inspiring about these people who are doing what they love. It made the whole city seem like it was filled with passion. They don't do it for money, but because they truly love it. I always gave at least 1000 won to them if they had a box sitting near by just to encourage them, but it's not necessary, which makes it absolutely free. The video above is of a street performer that did a Japchae song for us one night. He's totally cool. 2) Free Events on "Yonsei College Street"
Every Saturday and Sunday they close off the main road opposite Yonsei University, where Uplex and the different stores are located. After doing some research, I found that the street is called "Yonsei College Street". Most of the time we only walked past these free events (from art fairs to free indie concerts) but if I had more time I would have explored them more. Sometimes certain activities ask you to pay a fee but there's plenty of things to look at for free. The end of the video above shows an indie concert we ran into on our way back from Samcheongdong. They're called Seenroot and their songs are hilarious. T.UM is something I found while Rebecca and I were completing our list of things to do. She works in IT so I thought it would be cool for us to see the technology Korea has to offer. It wasn't until we made reservations that we realized this was completely free. The tour was done really professionally and we got to see a lot of cool stuff, including a self-driving car. They provided translators and even gave us a free picture and notepad set at the end of the tour. It's not just some boring museum but a truly interactive experience. Even though I had a really traumatic experience here, I want to go back one day, when it's not monsoon season, and watch a full show while eating fried chicken. Of course fried chicken costs money but watching the Banpo Rainbow Bridge show doesn't cost a cent. Enjoy a relaxing evening by the Han River while listening to Kpop and watching water spray from the bridge. But don't wear flip flops...if you watch the video...you'll understand why. I didn't get to do this but apparently several places that I went to offered these tours, including Namsan and Unhyeongung. These free tours are offered by the city of Seoul and I expect them to be very interesting. I love history, so if you love history too, these free tours may be of interest to you. We went to go get hanbok pictures one day and decided to go to this small palace because there was no entrance fee. Hanbok renting cost some money but it's a great place to just look around and take pictures for free. There's often not many people here compared to Gyeongbukgong. I found it more interesting than the other historical villages I've been to. Oh yes, the activity of Kpop fans' dreams: Visiting Entertainment Buildings. We visited YG on one day and did FNC, CUBE, SM and JYP on another (I never did upload that vlog). It's a lot of walking and can be brutal on a winter day but it is free and you might run into some Kpop stars. It's not free if you go up but I urge you not to pay to go up. In my opinion Seattle's space needle is much better and the night view looks pretty much the same everywhere. If you want to see the locks that have appeared in "We Got Married" and other Korean shows, you don't need to go up. I only realized after coming down that they are at the bottom. If you walk up to the tower, like we did, you don't even have to pay for the lift. But boy...is it a steep hill. Another historical site that is free to enter. This one has a bit more activities than Unhyeongung as you'll see from the vlog. I wasn't very interested in this place but I did find the cutouts you could stick your head in and take pictures as a historical person very amusing. And if you're there in time for Sky Festival (sometime in September I believe) It is a free Kpop concert put on by Incheon airport. There's a lot of these so this is only an example, do your research and make friends with other Kpop obsessed people. But yes there are a lot of free Kpop concert activities in Korea. I decided it wasn't really worth it to wait 5 hours and then get trampled by crazy fan girls though.